Joel Feder April 12, 2017 Comment Now! Concluding what has to be the longest teaser campaign in the history of the automotive industry, Dodge has unleashed the 2018 Challenger SRT Demon. And the car doesn't disappoint. In fact, it was banned by the NHRA because it's too fast for the dragstrip. With performance numbers that are mind boggling, this Dodge halo car is a perhaps the ultimate expression of the American muscle car. It all starts with the numbers. Peak output is 840 horsepower and 770 pound-feet of torque, making it one of the most powerful V-8 cars ever produced, and that's just the beginning. It has so much power it can lift the front wheels off the ground for 2.92 feet, making it the first production car to do so, and that's been certified by Guinness World Records. The quarter mile time? A flat out amazing 9.65 seconds at 140 mph, and that was certified by the NHRA. For those keeping score at home, that means the Demon is the fastest production car in a straight line down the quarter mile. It can pull 1.8 g in acceleration, and run 0-30 mph in 1.0 second while running 0-60 mph in just 2.3 seconds. Yes, you read correctly, and that makes it the fastest production car in the 0-60 mph sprint in the world, regardless of pricing or powertrain. Take that, Tesla. The craziest part of it all? This beast is a factory-built car with a three-year/36,000-mile vehicle warranty, and a five-year/60,000-mile powertrain warranty. How did all this happen? 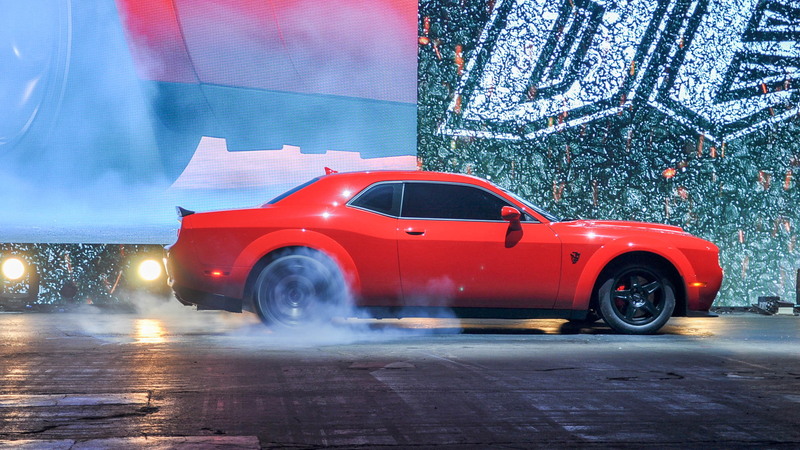 Dodge poured a massive amount of engineering into the Demon. This isn't just a Hellcat with a wide-body kit and more boost. No, more than 50 percent of the engine components have been upgraded over those of the Hellcat. The 2.7-liter supercharger is bigger than the Hellcat's 2.4-liter unit. Of course, boost pressure is up 2.9 psi for a total of 14.5 psi of boost. The redline has been raised from 6,200 rpm to 6,500 rpm, and there's now dual-stage fuel pumps instead of a single-stage pump. That massive air grabber hood? It's part of a larger induction box along with two other air intake sources. Like with the Hellcat, Dodge provides two keys. The black key, which you'll never use, limits engine output to 500 horsepower. The red key unlocks 808 horsepower and 717 pound-feet of torque on regular gas, and if you use the red key and run 100+ octane gas while using the optional Direct Connection powertrain controller, you get the full and quite insane 840 horsepower and 770 pound-feet of torque. And as we also learned from the barrage of teasers leading up to the Demon's introduction, this muscle car comes prepared for the dragstrip with a power chiller, after-run chiller, TransBrake, Torque Reserve feature, available front runners, and available Demon crate with parts and tools for the strip. The Demon rides on a square setup of street-legal drag tires specifically designed for the car by Nitto. Mounted on 18x11-inch aluminum wheels, the Nitto NT05Rs are 315/40s with a 15-percent larger contact patch than the Hellcat giving it, according to Dodge, twice the grip. We can only imagine that the turning radius is about 100 feet. 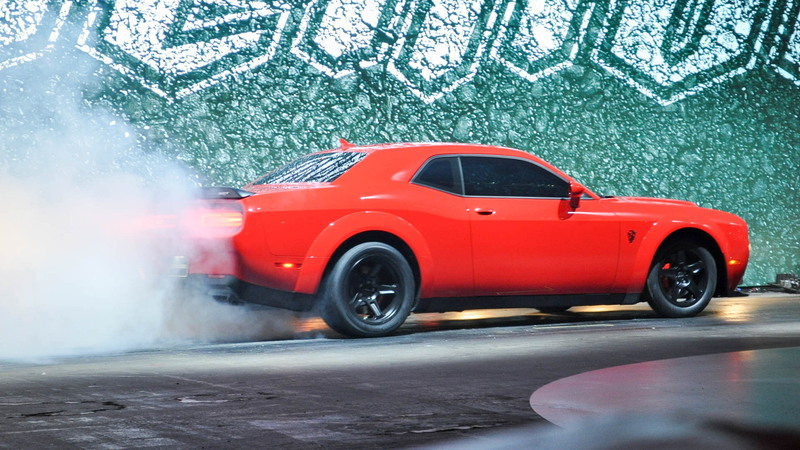 For those who think that's ridiculous, Dodge will also offer skinny frontrunner drag tires as part of the Demon Crate (more on that later). 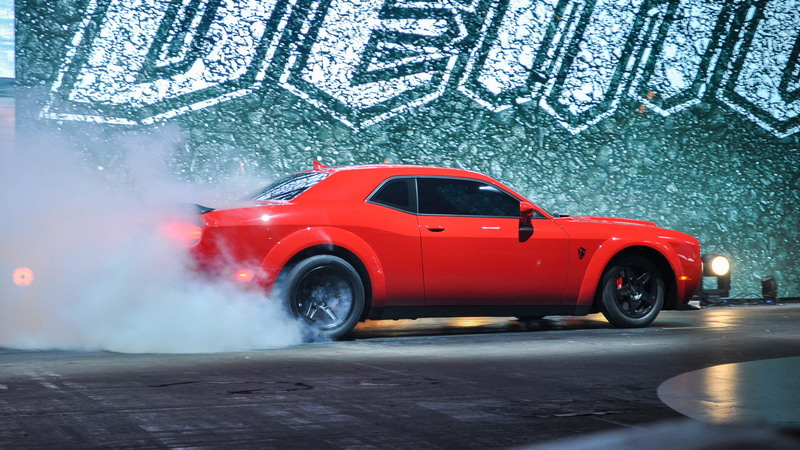 For those who think the Hellcat is too fat, the Demon went on a diet to the tune of more than 200 pounds. 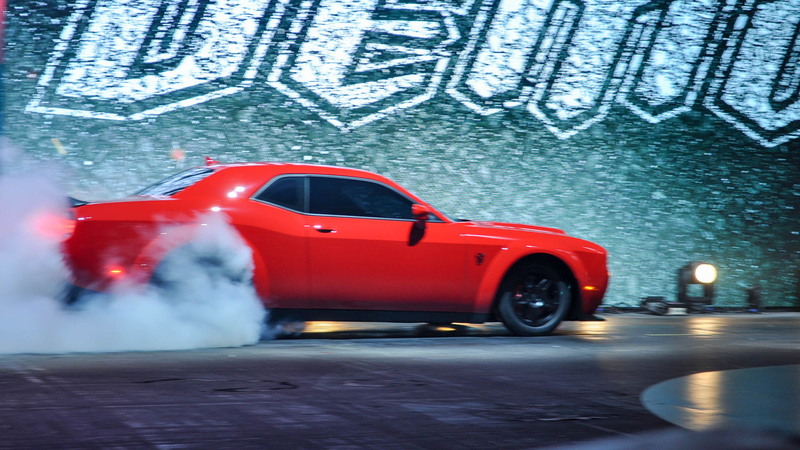 Just as you'll find in other performance vehicles, including the Hellcats, the Demon has driving modes. Appropriately, they are Auto, which is also known as Street, Plus Drag, and Custom. These modes control everything from horsepower output and gasoline octane mode to suspension firmness, transmission calibration, steering, and where the cabin cooling is directed. As you can tell, this is a serious car meant for the strip. Given that, a four-point harness bar (not a full roll cage) will be available from Speedlogix, and it bolts right into the Demon with mounting points straight from the factory. Demons come stock with just a driver's seat, but the rear seat and front passenger seat can be added back as an option for $1 each. While cloth seats are standard, leather is available. Options are few, but that Demon Crate with tools and parts is on the list, as is the Direct Connection controller, trunk carpeting, a Harmon Kardon 900-watt 19-speaker audio system, a sunroof, and heated and ventilated leather front seats with a heated steering wheel. Buyers can get a satin black finish on the hood, or on the hood, roof, and decklid. We recommend the latter for maximum malevolence. 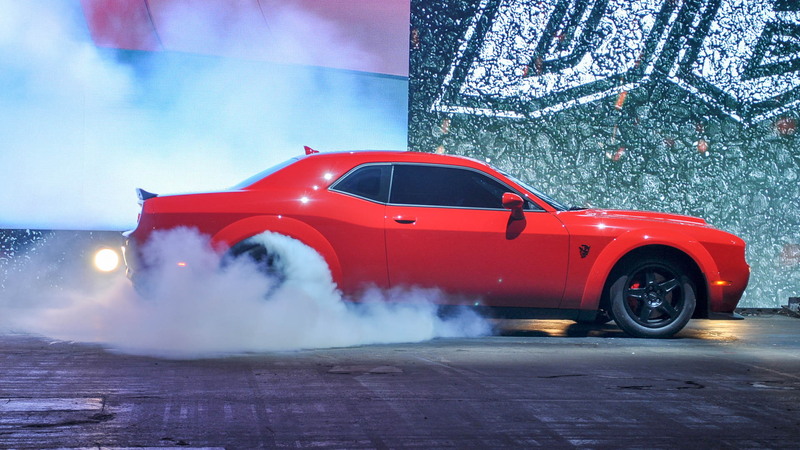 Dodge hasn't set pricing, but only 3,300 Demons will be made with 3,000 going to the U.S. and 300 to Canada. Production will start this summer with Demons being unleashed to dealers this fall. Before that it will prowl the halls of the 2017 New York auto show which starts Wednesday. For full coverage on the show, head to our dedicated hub. The Demon's Crate: What's in the box?